For others with this name, see Arrianus (disambiguation). The Anabasis of Alexander by Arrian is considered the best source on the campaigns of Alexander the Great. However, more recently, even though modern scholars have generally preferred Arrian to other extant primary sources, this attitude towards Arrian is beginning to change in the light of studies into Arrian's method. Arrian was born in Nicomedia (present-day İzmit), the provincial capital of Bithynia. Dio called him Flavius Arrianus Nicomediansis. In respect of his birth date, sources provide similar dates for his birth; within a few years prior to 90, 89, and 85–90 AD. The line of reasoning for dates belonging to 85-90 AD is from the fact of Arrian being made a consul around 130 AD, and the usual age for this, during this period, being forty-two years of age. (ref. p. 312, & SYME 1958, same page). His family was from the Greek provincial aristocracy, and his full name, L. Flavius Arrianus, indicates that he was a Roman citizen, suggesting that the citizenship went back several generations, probably to the time of the Roman conquest some 170 years before. Sometime during the 2nd century AD (117 to 120 AD) while in Epirus, probably Nicopolis, Arrian attended lectures of Epictetus of Nicopolis, and proceeded within a time to fall into his pupillage, a fact attested to by Lucian. All that is known about the life of Epictetus is due to Arrian, in that Arrian left an Encheiridion (Handbook) of Epictetus' philosophy. After Epirus he went to Athens, and while there he became known as the young Xenophon as a consequence of the similarity of his relation to Epictetus as Xenophon had to Socrates. For a period, some time about 126 AD, he was a friend of the emperor Hadrian, who appointed him to the Senate. He was appointed to the position consul suffectus around 130 AD, and then, in 132 AD (although Howatson shows 131), he was made prefect or legate (governor) of Cappadocia by Hadrian, a service he continued for six years. When he retired, Arrian went to live in Athens, where he became archon sometime during 145 or 146 (EJ Chinnock shows, he retired to Nicomedia and was appointed priest to Demeter and Persephone while there). He died in the reign of Marcus Aurelius. Τhis quality is identified as paideia (παιδεία) which is the quality considered to be of one who is known as an educated and learned personage, i.e., one who is highly esteemed and important. There are eight extant works (cf. Syvänne, footnote of p. 260). The Indica and the Anabasis are the only works completely intact. His entire remaining oeuvre is known as FGrH 156 to designate those collected fragments which exist. This work is the earliest extant work that is dated with any confidence. It is a writing addressed to the Emperor Hadrian. Arrian was a pupil of Epictetus around 108 AD, and, according to his own account, he was moved to publish his notes of Epictetus' lectures, which are known as Discourses of Epictetus, by their unauthorized dissemination. According to George Long, Arrian noted from Epictetus' lectures for his private use and some time later made of these, the Discourses. Photius states that Arrian produced two books the Dissertations and the Discourses. The Discourses are also known as Diatribai and are apparently a verbatim recording of Epictetus' lectures. The Enchiridion is a short compendium of all Epictetus' philosophical principles. It is also known as a handbook, and A Mehl considers the Enchiridion to have been a vade mecum for Arrian. The Enchiridion is apparently a summary of the Discourses. JB Stockdale considered that Arrian wrote eight books of which four were lost by the Middle Ages and the remaining ones became the Discourses. In a comparison of the contents of the Enchiridion with the Discourses, it is apparent that the former contains material not present within the latter, suggesting an original lost source for the Enchiridion. Friendly conversations with Epictetus (Homiliai Epiktetou) is a 12 book work mentioned by Photius in his Bibliotheca, of which only fragments remain. The Anabasis of Alexander comprises seven books. 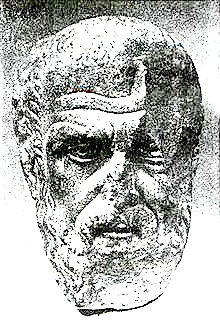 Arrian used Xenophon's account of the March of Cyrus as the basis for this work. History of the Diadochi or Events after Alexander is a work originally of ten books; a commentary on this work was written by Photius (FW Walbank, p. 8). Three extant fragments are the Vatican Palimpsest (of the 10th century AD), PSI 12.1284 (Oxyrhynchus), and the Gothenburg palimpsest (of the 10th century also), these possibly stemming originally from Photius. The writing is about the successors of Alexander the Great, circa 323 – 321 or 319. A lost work of seventeen books, fragments of Parthica were maintained by the Suda and Stephen of Byzantium. The work survives only in adaptations made later by Photius and Syncellus. Translated, the title is History of the Parthians. Arrian's aim in the work was to set forth events of the Parthian war of Trajan. The writing mentioned that the Parthians trace their origins to Artaxerxes II. A work of eight books, Bibliotheca (via Photius) states it is the fourth to have been written by Arrian. A work translated a Nicodemian script (minor). Indica is a work on a variety of things pertaining to India, and the voyage of Nearchus in the Persian Gulf. The first part of Indica was based largely on the work of the same name of Megasthenes, the second part based on a journal written by Nearchus. Written 136/137 AD (in the 20th year of Hadrian), Techne Taktike is a treatise on Roman cavalry and military tactics, and includes information on the nature, arms and discipline of the phalanx. The hippika gymnasia is a particular concern of Arrian in the treatise. Another translation of the title is Ars tactica, which, in Greek, is Τέχνη τακτική. This work has generally been considered in large part a panegyric to Hadrian, written for the occasion of his vicenallia, although some scholars have argued that its second half may have had practical use. Cynegeticus (Κυνηγετικός), translated as the hunting man, is a work about hunting dogs, canes venatici, the Celtic grey-hound. The work is based on an earlier exposition made by Xenophon, whom Arrian thought to be the authority on the subject of hunting. Ektaxis kata Alanon (Ἔκταξις κατὰ Ἀλανῶν) is a work of a now fragmentary nature; the title is translated as Deployment against the Alani or The order of battle against the Alans or referred to simply as Alanica. It is thought not have been written as a presentation of facts but for literary reasons. Pertaining to the relevant historical facts, though, while governor of Cappadocia, Arrian repelled an invasion of the Alani sometime during 135 AD, a struggle in which Arrian's two legions were victorious. Within the work, Arrian explicitly identified the particular means of pursuing warfare as being based on Greek methods. Ektaxis kata Alanon is also translated as Acies contra Alanos. The work was known for a time as A History of the Alani (Alanike via Photius). A fragment describing a plan of battle against the Alani was found in Milan around the 17th century which was thought at that time to belong to the History. There were also a number of monographs or biographies, including of Dion of Syracuse, Timoleon of Corinth, and Tilliborus, a brigand or robber of Asia minor, which are now lost. Everything known of his life derives from the 9th century writing of Photius in his Bibliotheca, and from those few references which exist within Arrian's own writings. The knowledge of his consulship, is derived at the least from literature produced by Suidas. Arnobius (c. 3rd century AD) mentions Arrian. Arrian was also known of by Aulus Gellius. Pliny the Younger addressed seven of his epistles to him. Simplicius made a copy of the Encheridion, which was transmitted under the name of the monastic father Nilus during the 5th century, and as a result found in every monastery library. Nicholas Blancard made translations of Arrian in 1663 and 1668. The voyage of Nearchus and Periplus of the Erythrean Sea were translated from the Greek by the then Dean of Westminster, William Vincent, and published 1809. Vincent published a commentary in 1797 on The voyage of Nearchus. The work was also translated into French by M.Billecocq, under the auspices of the government (cf. p. 321). ^ "Arrian". www.britannica.com. Retrieved 2010-01-07. Arrian born c. AD 86, Nicomedia, Bithynia [now İzmit, Tur.] died c. AD 160, Athens? [Greece]. ^ Stadter's suggestion that his official name was Lucius Flavius Arrianus Xenophon ( Stadter, Philip (1967). "Flavius Arrianus: The New Xenophon". Greek, Roman and Byzantine Studies. Retrieved April 14, 2016. ) is disproven by epigraphic evidence: Bowie, E. L. “Greeks and Their Past in the Second Sophistic.” Past & Present, 46 (1970): 25 n. 72. ^ a b c FW Walbank (November 1984). F. W. Walbank, ed. The Cambridge Ancient History. Cambridge University Press, 6 Sep 1984. ISBN 0-521-23445-X. Retrieved 2015-04-01. ^ a b c "Arrian". www.britannica.com. Retrieved 2010-01-07. Arrian (born c. ad 86, Nicomedia, Bithynia [now İzmit, Tur.] died c. 160, Athens? [Greece]) Greek historian and philosopher who was one of the most distinguished authors of the 2nd-century Roman Empire. Wolfgang Haase; Hildegard Temporini (1990). Aufstieg und Niedergang der römischen Welt: Geschichte und Kultur Roms im Spiegel der neueren Forschung, Volume 2;Volume 34. Walter de Gruyter. p. 228. ISBN 3-11-010376-1. Arrian was of Greek stock, from the provincial aristocracy of Bithynia. His full name, L. Flavius Arrianus, demonstrates that he was a Roman citizen and suggests that the citizenship went back several generations, probably to the triumphal period. Arrian’s home city was the Bithynian capital, Nicomedia, where he held the priesthood of Demeter and Kore, its patron deities. Arrian; Sélincourt, Aubrey De (1971). The campaigns of Alexander. Penguin Classics. p. 13. ISBN 0-14-044253-7. Flavius Arrianus Xenophon, to give him his full name, was a Greek, born at Nicomedia, the capital of the Roman province of Bithynia, probably a few years before A.D. 90. Grant, Michael (1992). Readings in the classical historians. Scribner's. p. 544. ISBN 0-684-19245-4. ARRIAN: GREEK HISTORIAN Arrian was an approximate contemporary of Appian, born about AD 95. Like him a Greek, he came from Nicomedia (İzmit) in Bithynia (north-western Asia-Minor) where his family was prominent. ^ Heckel, Waldemar (2004). The History of Alexander. Penguin. pp. 5 & 269. ^ Bosworth, A.B. (1976). "Errors in Arrian". Classical Quarterly. 26: 117–139. doi:10.1017/s0009838800033905. ^ N. G. L. Hammond (2007-08-13). Sources for Alexander the Great: An Analysis of Plutarch's 'Life' and Arrian's 'Anabasis Alexandrou'. Cambridge University Press, 13 Aug 2007. ISBN 0-521-71471-0. Retrieved 2015-04-04. ^ EL Bowie (January 2002). PA Stadter; L. Van der Stockt, eds. Sage and Emperor: Plutarch, Greek Intellectuals, and Roman Power in the Time of Trajan (98-117 A.D.). Leuven University Press, 1 Jan 2002. ISBN 9058672395. Retrieved 2015-04-04. ^ "Arrian". www.britannica.com. Retrieved 2010-01-07. Arrian (born c. ad 86, Nicomedia, Bithynia [now İzmit, Tur.] died c. 160, Athens? [Greece]) Greek historian and philosopher who was one of the most distinguished authors of the 2nd-century Roman Empire. Wolfgang Haase; Hildegard Temporini (1990). Aufstieg und Niedergang der römischen Welt: Geschichte und Kultur Roms im Spiegel der neueren Forschung, Volume 2;Volume 34. Walter de Gruyter. p. 228. ISBN 3-11-010376-1. Arrian was of Greek stock, from the provincial aristocracy of Bithynia. His full name, L. Flavius Arrianus, demonstrates that he was a Roman citizen and suggests that the citizenship went back several generations, probably to the triumphal period. Arrian’s home city was the Bithynian capital, Nicomedia, where he held the priesthood of Demeter and Kore, its patron deities. Arrian; Sélincourt, Aubrey De (1971). The campaigns of Alexander. Penguin Classics. p. 13. ISBN 0-14-044253-7. Flavius Arrianus Xenophon, to give him his full name, was a Greek, born at Nicomedia, the capital of the Roman province of Bithynia, probably a few years before A.D. 90. Grant, Michael (1992). Readings in the classical historians. Scribner's. p. 544. ISBN 0-684-19245-4. ARRIAN: GREEK HISTORIAN Arrian was an approximate contemporary of Appian, born about AD 95. Like him a Greek, he came from Nicomedia in Bithynia (north-western Asia-Minor) where his family was prominent. ^ a b c I Syvänne (2013-10-21). Philosophers of War: The Evolution of History's Greatest Military Thinkers [2 Volumes]: The Evolution of History's Greatest Military Thinkers. ABC-CLIO, 21 Oct 2013. ISBN 0-313-07033-4. Retrieved 2015-04-01. ^ a b c d Hans-Josef Klauck (2003-05-01). Religious Context of Early Christianity: A Guide To Graeco-Roman Religions (p.350). A&C Black, 1 May 2003 (reprint, revised). ISBN 0-567-08943-6. Retrieved 2015-04-06. ^ a b JS Romm (2005-03-11). Alexander The Great: Selections from Arrian, Diodorus, Plutarch, and Quintus Curtius (p.xix). Hackett Publishing, 11 Mar 2005. ISBN 1-60384-333-7. Retrieved 2015-04-08. ^ a b c P. E. Easterling; B. M. W. Knox (1989). The Cambridge History of Classical Literature: Volume 1, Greek Literature, Part 4, The Hellenistic Period and the Empire (p.143 - ). Cambridge University Press, 4 May 1989. ISBN 0-521-35984-8. Retrieved 2015-04-05. ^ a b G Long, Epictetus (2010-01-01). Enchiridion and Selections from the Discourses of Epictetus, p.6. Digireads.com Publishing, 1 Jan 2010. ISBN 1-4209-3522-4. Retrieved 2015-04-03. ^ a b c JW McCrindle (1816). The Invasion of India by Alexander the Great, p.9-10. Cosmo Publications, 1816 – original of google books from University of California, Berkeley. Retrieved 2015-04-03. ^ a b AB Bosworth (2012-03-29). The Oxford Classical Dictionary – edited by S Hornblower, A Spawforth, E Eidinow. Oxford University Press, 29 Mar 2012. ISBN 0-19-954556-1. Retrieved 2015-04-02. ^ a b N Fields (2009-03-31). The Roman Army of the Principate 27 BC-AD 117 p.41-42. Osprey Publishing, 2009. ISBN 1-84603-386-1. Retrieved 2015-04-01. ^ a b c d A. B. Bosworth. Arrian's Literary Development The Classical Quarterly New Series, Vol. 22, No. 1 (May, 1972), pp. 163-185. Cambridge University Press. JSTOR 637903. ^ S Swain (1996). Hellenism and Empire: Language, Classicism, and Power in the Greek World, AD (p.328ff.). Oxford University Press, 1996. ISBN 0-19-814772-4. Retrieved 2015-04-05. ^ R Waterfield (2012-08-02). Dividing the Spoils: The War for Alexander the Great's Empire. Oxford University Press, 2 Aug 2012. ISBN 0-19-964700-3. Retrieved 2015-04-06. ^ a b EL Bowie (2013-01-11). Studies in Ancient Society (Routledge Revivals) p.191-192. Routledge, 11 Jan 2013. ISBN 1-136-50564-4. Retrieved 2015-04-02. ^ G Hill. A History of Cyprus, Volume 1. Cambridge University Press, 23 Sep 2010. ISBN 1-108-02062-3. Retrieved 2015-04-06. (p.156 footnote 4 is the location of < Ta met' Alexandron >. ^ EM Anson. Alexander's Heirs: The Age of the Successors. John Wiley & Sons, 24 Apr 2014. ISBN 1-118-86240-6. Retrieved 2015-04-02. ^ Encyclopædia Iranica (general editor: E Yarshater). Arrian. Retrieved 2015-04-03. ^ PA Stadter -. The Ars Tactica of Arrian: Tradition and Originality – Classical Philology Vol. 73, No. 2 (Apr., 1978), pp. 117-128. The University of Chicago Press. JSTOR 268990. ^ E Ferguson. Encyclopedia of Early Christianity, Second Edition (p.379). Routledge, 8 Oct 2013. ISBN 1-136-61158-4. Retrieved 2015-04-06. Phillips, A. A., and M. M. Willcock (eds.). Xenophon and Arrian On Hunting with Hounds. Cynegeticus. Oxford: Aris & Phillips, 1999. ISBN 0-85668-706-5. P. A. Stadter, Arrian of Nicomedia, Chapel Hill, 1980. R. Syme, 'The Career of Arrian', Harvard Studies in Classical Philology vol.86 (1982), pp. 171–211. Cartledge, Paul; Romm, James S.; Strassler, Robert B.; Pamela Mensch (2010). The Landmark Arrian: The Campaigns of Alexander. New York: Pantheon. ISBN 0-375-42346-X. Yardley, J. & Heckel, W. (2004) The History of Alexander, Penguin, London, pp.5 & 269. Brodersen, K. (2017) Arrianos / Asklepiodotos: Die Kunst der Taktik. Greek and German, De Gruyter, Berlin ISBN 978-3-11-056216-3. Collected works: Flavii Arriani quae exstant omnia, A. G. Roos (ed. ), 2 vols., Lipsiae, in aedibus B. G. Teubneri, 1967–68. Arrian, Anabasis Alexandri, (section 1.13-16) (pdf, pp. 18-19), Battle of Granicus, from the Loeb Classical Library edition. Arrian, The Indica translated by E. Iliff Robson. Arrian, Array against the Alans (Ἔκταξις κατὰ Ἀλανῶν) translated by Sander van Dorst, with the Greek (transliterated) and copious notes. This page was last edited on 16 February 2019, at 04:50 (UTC).